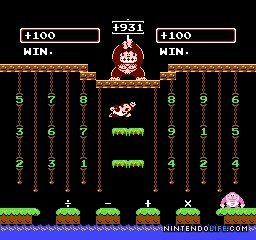 the release of the new smash bros. on 3DS has pretty much completely ruined my chances of finishing any other games for the near future, but i took a break from it to sit down with my remaining donkey kong game on NES, donkey kong jr. math. i wasn’t quite sure what to expect, and i was somewhat disappointed to find that the main two modes are 2-player only. also, because i know donkey kong jr. so well the changes in the mechanics were a bit odd at first, namely, that DK jr. no longer has his two-armed faster ascent and instead moves the same speed when travelling up or down a vine. after i got over my initial reaction i found the game to actually be fairly enjoyable overall, and as is often the case that it feels like this is yet another one of those games that people dismiss without actually giving it a fair chance. the game re-uses most of the mechanics from donkey kong jr. so the jumping is a bit stiff, but otherwise the controls work pretty well. the goal of the main two modes are simple: select numbers and operators in order to reach a specified total number. selecting numbers and operators with DK jr. is more fun than just tapping numbers into a calculator, and although the first mode is pretty straightforward the second mode is actually more satisfyingly challenging. in the first mode you’re often putting together simple equations, like making 37 by selecting 9 * 4 + 1, but in the second mode the number you’re trying to reach is harder to get to since you’re restricted to a pool of 18 numbers, each of which can only be 1 through 9, and the target numbers often have large values and can be negative. so to reach a number like 285 from a starting number of 200 requires some thought, e.g. divide by 5, then multiply by 7, and then add 5. although i didn’t get to play with another person, it’s easy to imagine that going head to head could actually be pretty fun, what with getting in each other’s way, stealing numbers that the other person wants, and having to quickly change your strategy based on what numbers are closer to you. the third mode is just a series of exercises of different types (e.g. large number addition, simple multiplication, long division, etc. ), with a sort of complicated scheme. in each set you’re given 10 problems and the bird on the left drops an egg if you solve it perfectly the first time. the bird on the right shows you which “place” you’re entering numbers for (e.g. for addition that bird will fly over the ones place, then the tens place, hundreds place, etc. ), and you can give up at any time by pushing the key into the lock. selecting numbers requires you to climb up and down a chain representing one of the digit places, and to input a number you just move to a different chain. the controls here are a bit more awkward than the other two modes, but since apparently you’re also scored on how quickly you complete each problem, precision and speed is also rewarded. the mode is a bit dry, but still somewhat entertaining (and did work certain brain muscles i haven’t used in a very long time). as i said, although it’s easy to dismiss games like these, as nintendolife did in their review of the wii virtual console release, those who take the time to actually give it a chance will find a reasonably entertaining game (as nintendolife’s review of the wii u VC version attests). the main downside to the main mode is that it really requires both players to be at the same math level: it’s not really designed for, say, a parent and a child to play together, unless perhaps if the parent is already handicapped by just being unfamiliar with how to play video games. the game may have originally been created as an “edutainment” title with the goal of trying to remove some of the stigma of video games and it apparently was not received well at the time, and although it’s gotten a bad rap over the years i found it to be much more worthwhile than most reviews would claim. – i’d forgotten this, but the game was actually spotlighted in a fairly recent nintendo minute video. the video makes it look like 2P would actually be pretty fun.